What's Wrong with the Pinoy Crab Mentality? Another good reason why the Philippines hardly progresses is because of crab mentality. So much for the statement of the Philippines being united and for the "magkakaisa" or "unity" slogans huh? One might observe how diverse the Philippines is... like you can have it that most of the Visayas is better than the rest of the Philippines and Cebu is the business capital of the Philippines. Crab mentality can be observed in the basket of crabs case. As a person who ate crabs in the past but not a huge fan of it, I remembered my late paternal grandmother ordered a lot. As a child, I observed when one crab tries to get out of the basket, the others would drag saying, "If you're not happy, nobody deserves to be happy." and they don't want to see others to progress. 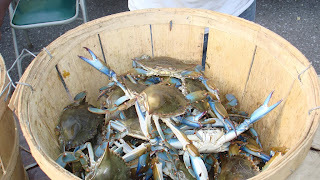 In the end, no crab gets out of the container and they all become dinner. Sad to say but that is one trait that gets the Philippines to go nowhere and it is a destroyer of progress in general. I mean, the U.S. also is going down thanks to crab mentality. It can also destroy any organization resulting in self-cannibalization. After all, think of the I must be better than the rest mentality must have also been another good reason why authority figures, law enforcers and subordinates in the Philippines bungle up an otherwise well thought of plan. You can observe that daily and believe me, it's not getting any better. The activist groups like the Bobo Muna, Anak ng Bobo and Migraine International are also guilty of that too in some way. You might also consider why some OFWs are more of a nuisance because of crab mentality. It's okay to have an employee of the month award but one must be certain- everybody must work hard together. Individual assessment is needed to avoid free riding but giving too much individual rewards can cause too much competition. Any component needs all its buttons functioning properly to work right? Just imagine working on a keyboard with even one vital key missing... it's frustrating isn't it? In fact, that's why crab mentality must be disposed of.